We scored a great closeout price on a limited number of these Assen perforated leather pants (sorry, the solid pants are not a closeout at this time). Limited to stock on hand. The Assen sport pant comes in two versions… perforated and solid. The perf’ed one is sold on this product page… take the link below to view the solid version. There is a visual difference of course, but functionally, the perforated pants will breathe a bit better for warmer weather use and the solid jacket will be better for cooler/cold weather since the solid leather will block air flow and allow your undergarments to keep you warmer. If you are considering the perforated version, be sure have a look at the close-up pictures… the perforations are done on a precise pattern leaving the edges of each leather panel solid. I guess they cut the pattern and then perforate the holes specific to each cut piece. Most people wouldn’t have much appreciation for this, but I think it is sharp and functionally a seam through solid leather will be stronger than stitching through perfed leather. I just thought is was worth a mention as being an indication of the overall quality of these pants. The Assen leather pant is a classic styled sport pant. It is highly “pre-cut to be comfortable in the sport/tuck position. The legs are tapered to the ankle and cut to reach the top of the foot (see our sizing advice above). The waist is adjustable with Velcro tabs and the pants have a full around zipper to attach to Dainese jacket with the mating zipper. You can wear these pants with any jacket, but the zipper setup is only designed to work with Dainese jackets. You notice the large expansion panels above the knee. The expansion panels allow for freedom of movement that wouldn’t be possible in a highly fitted sport pant style. Same goes for the stretch panels incorporated into the crotch area and down the insides of the legs. The material is abrasion resistant and tough, but also has some stretch. The waist is cut low in the front and higher in the back, again, to work best in a tuck position. The knees come fitted with very robust knee shin armor and the hips are fitted with pockets for optional hip armor (see the link below). The pants also have Velcro for knees. The pants come with leather patches affixed over the knee slider Velcro so you can have a finished look without knee sliders. But if you want to add sliders, you remove the leather patches and stick on the sliders of your choice (they don’t have to be Dainese). 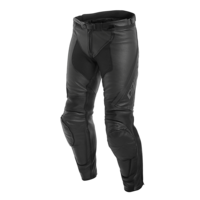 Dainese says: Combining lightweight, high mobility and a comfy sport fit with certified protection, these pants are engineered for great road riding. Tough Charge leather with perforated cooling zones (perforated versions only) integrates with S1 elasticated fabric panels and inserts for great performance support, plus hip adjusters, calf zips and dedicated men’s and women’s versions for a closer fit. The multiple safety features include leather knee patches designed for Pista sliders and pockets for hip protectors. Let the rider decide.